Pete Seeger was in the U.S. Army in 1942, stationed at Fort Meade, near Washington, D.C. He was granted a weekend pass to visit New York, where he met up with friends–Butch Hawes, Bess Lomax and Tom Glazer–to record a few anthems from the Spanish Civil War for Moses Asch. One, “Viva La Quince Brigada,” was particularly troublesome. Seeger favored C tuning for certain songs because of the bass range it offered his banjo, but C minor was still too high for him to comfortably sing the melody. It was an idea that was radical and elegant all at once, and Seeger acted on it quickly, dragging his Vega Whyte Laydie down to luthier John D’Angelico’s Lower East Side shop for what amounted to major surgery. And hold it did, for at least half a dozen years; considering D’Angelico’s legendary skill, probably quite a bit longer. We may never know. Like the punch line to a bad musician’s joke, the instrument was stolen from the backseat of Seeger’s car in 1949, while he ducked into a café to grab a cup of coffee. 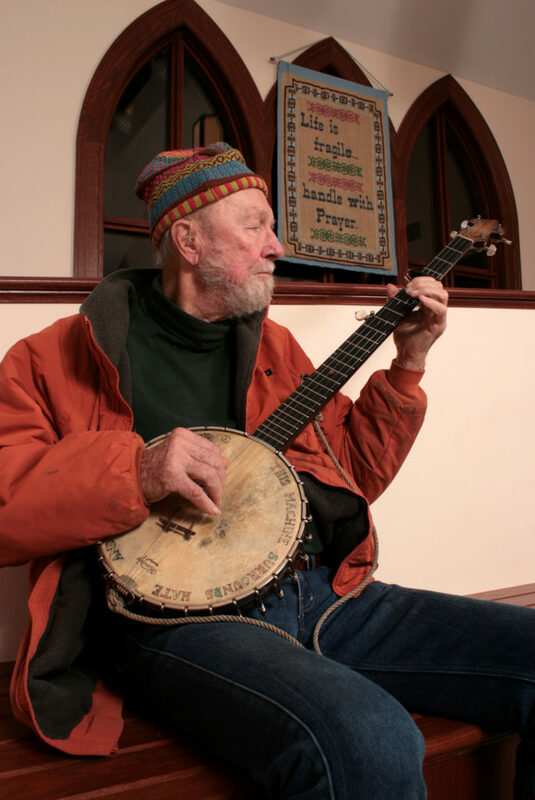 When Pete Seeger was struck with banjo fever, in his teens, the instrument was an almost forgotten piece of American history, a relic of minstrel shows and barn dances. But Seeger–whom Alan Lomax once said “looked like a banjo”–came from an important musical family. His father, Charles, was an esteemed conductor and pioneering ethnomusicologist whose left-leaning views would influence his children. And his mother, Constance, was an accomplished violinist and music teacher. After Pete’s parents divorced in 1927, Charles married fellow composer and musician Ruth Crawford, who bore Pete’s influential half-siblings Mike, Peggy and Penny Seeger. The long, lanky scion traveled frequently with his family, and in the summer of 1936, when the well-bred but wild lad was 17, his father, working under the auspices of the Rural Resettlement Administration, took him to Bascom Lamar Lunsford’s Mountain Dance and Folk Festival in Asheville, North Carolina. There he was thunderstruck by the clawhammer stylings of Lunsford, Samantha Bumgarner and other country pickers. The unexpected blend of rural showmanship, musical intensity and sheer drive marked Seeger forever, and the five-string–like the ukulele during childhood and the tenor banjo in his teenage years–became his obsession. Within a few years, he was picking his way across America, killing banjos in the process. He broke his first–an ancient Stewart acquired at a Manhattan hockshop for $5–while leaping off a fast-moving freight train. Like the Whyte Laydie to follow, the Stewart disappeared. “I never got it back,” Seeger says. “I sent it to somebody for repair and I never saw them again.” Later on, Seeger would snap another banjo in two, slamming it down in a rage at a group of pushy backstage tipplers. More deaths would follow. Back in New York, though, primed by their boxcar and highway travels, Guthrie, Seeger and a group of likeminded New York liberals formed the Almanac Singers in 1941. To their dismay, the country wasn’t quite ready for a bunch of lefties singing sea chanteys and union songs. By the dawn of the next decade, the seeds of a looming folk boom were being planted by Seeger, Fred Hellerman, Ronnie Gilbert and fellow Almanac alum Lee Hays. They called themselves the Weavers and they made their public debut at the Village Vanguard in late ’49. By that time, Seeger’s extended-neck Vega Whyte Laydie–which he had grabbed for the princely sum of $10, at the same pawnshop where he found the Stewart–was already gone. Seeger, who turned 90 this past spring, no longer can recall exactly what banjos he played in the Weavers. (“I think I had two of them and I wasn’t satisfied with either.”) Photos from the era show Seeger holding a standard Orpheum No. 1, as well as a stretched version of the same instrument. We do know that on history-making hits like “Kisses Sweeter Than Wine,” “Tzena, Tzena, Tzena” and “Goodnight, Irene,” Seeger played a longneck banjo boasting three additional frets; the original Vega only had an extra pair. By the mid-’50s, Seeger was making solo records for Asch’s Folkways label in Manhattan, singing with the on-again, off-again Weavers and building additions to his log-cabin home in the Hudson Valley. It was clear that he was ready to make an instrument for the ages. Pete Seeger’s banjo is an amazing object. It weighs a ton, it looks like death and it sings like an angel. It’s been around the world and in the ditch; amazingly, it’s still around to tell its own story–which, in some ways, Seeger won’t. He’ll talk about how he made it and how he plays it, but he’s loath to crow about where it’s been or the remarkable work it’s done. “It’s been everywhere I go,” is the most he’ll say. The banjo’s most recent notable appearance might have been at a Lincoln Memorial concert preceding Barack Obama’s January inauguration; it was hanging from a rope around Seeger’s shoulder, with the old man couched between Tao Rodriguez-Seeger–his loving grandson–and Bruce Springsteen. Seeger, of course, first sang at the Memorial in August of 1963, cheering on Dr. Martin Luther King at the March on Washington for Jobs and Freedom. But the instrument is also a frequent presence in classrooms and day camps in the region around Seeger’s Beacon, New York, home. 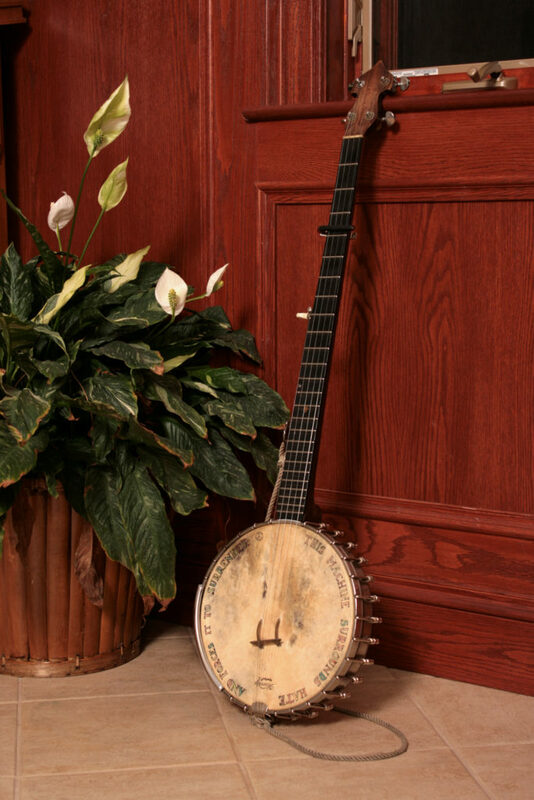 The reason for the banjo’s heft is simple: The 25-fret neck–nearly two inches wide at the 15th fret–is made from solid lignum vitae, one of the densest woods in the world. It’s so dense it sinks. The species, sometimes called ironwood, is native to the Caribbean and the northern coast of South America. “Lignum vitae,” he says, spelling out the words. “It’s very hard and, like ebony, it’s a rare wood. They make marine bearings out of it.” Indeed, it’s so naturally hard and self-lubricating that one of its primary uses throughout history has been for naval belaying pins and stave bearings. A nostalgic warmth creeps into the master’s voice as he talks about the wood, and if his memory is admittedly spotty about some things, it’s quite sharp when it comes to the creation of the neck that has fit in his left hand for more than 50 years. Once neck and pot were joined, the instrument started gathering battle scars almost immediately. It’s as though the beast never had a quiet, pristine moment to itself. Seeger took the contraption, which is what it was, back to his buddy John D’Angelico, who’d helped wrest the first elongated neck out of the Whyte Laydie years before. 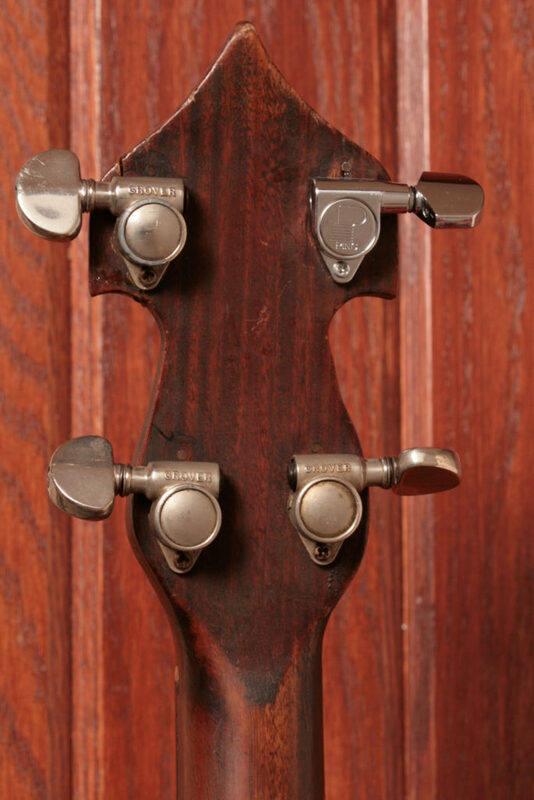 By this point, however, the archtop pioneer had an assistant, and the job of fretting the homemade neck fell to the young Jimmy D’Aquisto, who was well ensconced in the Kenmare Street shop by the mid-’50s. “It was an Italian name,” Seeger recalls with a chuckle. “He became quite a well-known guitar maker, too.” At the time, though, D’Aquisto was still an apprentice, and things went, to Seeger’s mind, a little awry. 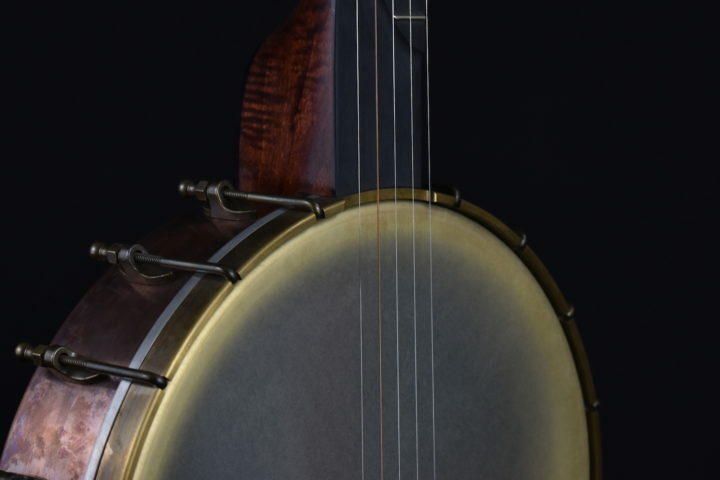 A close look reveals pale white lines filled in where the original frets were laid–the banjo’s first battle scars–and it will also reveal an ebony fretboard, an addition that upset Seeger considerably at first (and caused the huge heel of the homemade neck to dip even further below the pot). The string gauges on Seeger’s banjo are often up for grabs; a bulky, rubber-banded stack of variously branded loose envelopes in his Blue Heron bag backs that up. Seeger generally picks the banjo with his bare fingers. Occasionally, he’ll don finger picks–one of which he keeps bent nearly flat and wears flipped around for down strokes–but he doesn’t use a thumb pick on the five-string. Seeger uses a Shubb 12-string capo on the banjo, largely due to the width and depth of the neck. (Watching his 90-year-old fingers fly around between the capo and the fifth peg between songs is almost as entertaining as hearing him actually play.) For his fifth-string capo, Seeger simply has a single screw drilled into the fingerboard at the 13th fret, and he wrestles the geared, side-mounted tuner as needed to hit the right spot. 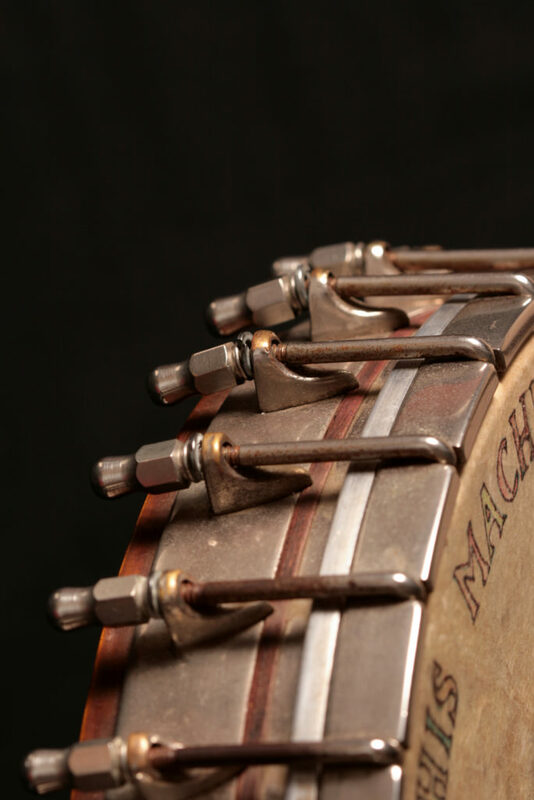 More than a few of the banjo’s other battle scars–including various empty screw holes–are remnants of previous capo experiments. A long, deep groove, for example, runs down a portion of the back of the neck, bearing witness to an ill-fated idea from songwriter and “Plastic Jesus” popularizer Ernie Marrs. 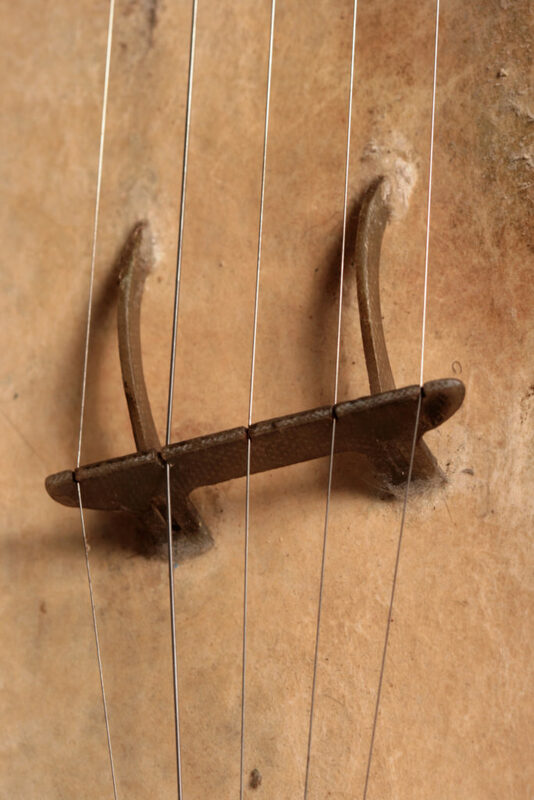 Marrs devised a fifth-string capo, made from a piece of clock spring, that clipped into the groove and up over the edge of the neck. 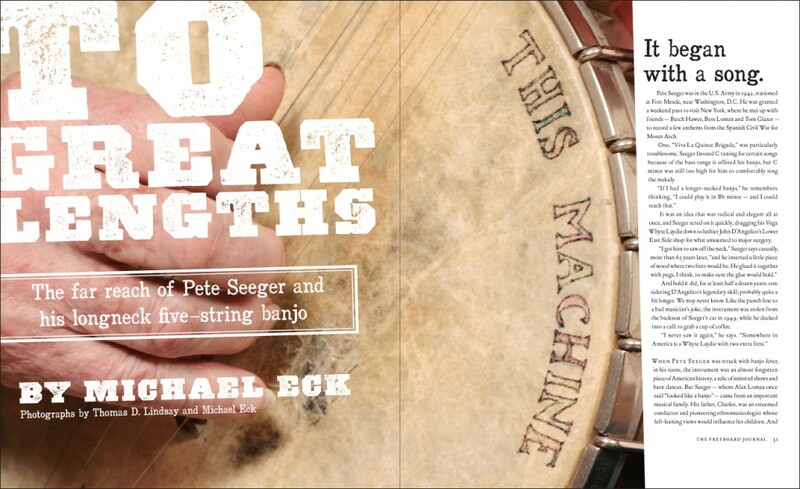 Seeger advocated for the Marrs device in the third edition of his banjo book, but he didn’t use it long himself. “I’m not sure it’s really that great a bridge,” he says. “One thing I can say, it doesn’t ever fall over, even when I wham the banjo as hard as I can.” To compensate for the thicker gauges of the low strings, Seeger keeps the Jamieson bridge canted at a severe angle. Another one of the banjo’s best-known features is a little more ephemeral. 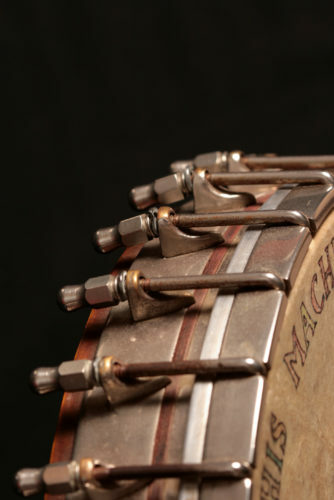 Printed by hand around the edge of the rim are the legendary words: “This Machine Surrounds Hate and Forces It to Surrender.” Seeger, who aspired to be a painter in his youth, doesn’t recall just when he started lettering the motto on the drum, but it has become, by far, the banjo’s most photographed element. Seeger–confident in the face of advancing age–says the current, worn Waverly Fiberskyn 2 head should be up for replacement soon. Seeger has owned a few other longnecks since he built his own in 1955; most of them were gifts, but none are more famous than the Vega Pete Seeger model that was given to him by the company in 1960. He played the Vega frequently throughout the ’60s, but gave it away when Sing Out! magazine offered the instrument as a contest prize in an effort to boost subscriptions in the early ’70s. In August of 2000, it seemed as if Seeger’s iconic homemade banjo was gone as well. News wires reported that the banjo was missing, perhaps even stolen. In reality, Seeger, then 81, had left the banjo on top of his car while in nearby Rosendale, New York. Seeger did not drive over it, as he had once done to one of his guitars; he simply drove away without it, not noticing as it slid off the roof. In the nervous intervening time, one miscreant from Chicago called to say he had the banjo and asked Seeger to send $100 to cover express shipping. (“He just took my hundred dollars,” Seeger says. 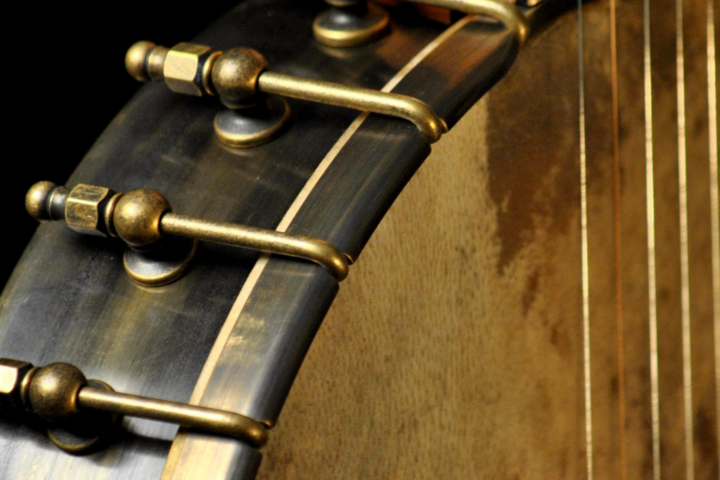 “He didn’t have the banjo.”) Finally, the instrument came home, seven long days later. 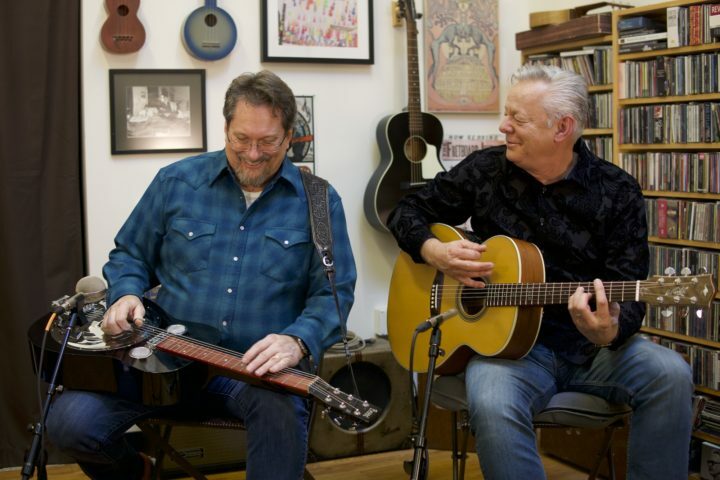 “He’s been hanging the banjo by the headstock on two dowels that come out from the wall brace,” Taylor says, “so that whole instrument has got its weight hanging right on those two points that are right in line with the tuners. 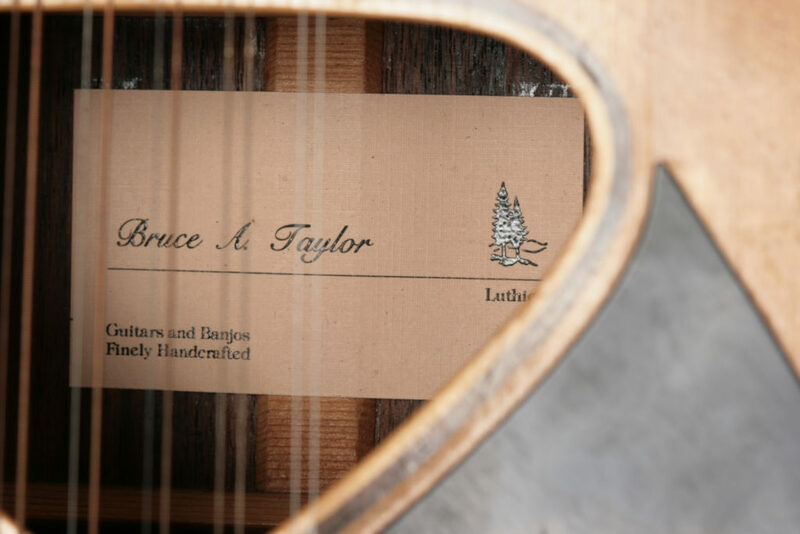 The headstock cracked under the second-string tuner, and Pete glued that one back on himself. Subsequent to that, the other side cracked off, and he asked me to glue that back together.” Taylor dutifully attached a shiny, imported Ping tuner in place of the existing Grover. “I think her name was Franca,” he says, but the memory stops there. Seeger wrote the island-tinged “Living in the Country” on the Tatay, later a concert staple for 12-string enthusiast Leo Kottke. The Tatay, as well as the other instruments, will likely end up in his grandson Tao’s hands when Seeger’s time comes. Tao Rodriguez-Seeger has been at his grandfather’s side–a close friend and musical companion–since he was just a boy. At the Obama inauguration, it was, tellingly, Rodriguez-Seeger who anchored the monumental take of Guthrie’s “This Land Is Your Land” while Seeger lined out the song for the masses and Springsteen mugged for the cameras. Sure enough, Rodriguez-Seeger is on hand when we meet his grandfather to take pictures of his instruments at the United Methodist Church in Hyde Park, New York; the eldest Seeger–the man Carl Sandburg once called “America’s tuning fork”–has come to try and hide in the crowd at his niece’s November concert. Running late, he offers a brief hello, opens the trunk and motions for us to take the instruments. Then he and his family head into the show. When they return two hours later, Seeger is clearly bone-tired and not in the best of moods, but he agrees to pose for a few pictures. He picks up the banjo, bent brackets and all, and, as if to prove a point about its five decades of durability, he promptly bangs the already battered headstock into the wall–something that longneck veterans know isn’t really that hard to do. It’s indeed a very special moment, for Pete Seeger is a national treasure, and his longneck banjo is a precious piece of American history.